Brian K. Vaughan is reuniting with The Private Eye artist Marcos Martin and colorist Muntsa Vicente for a five-issue miniseries from Image Comics. 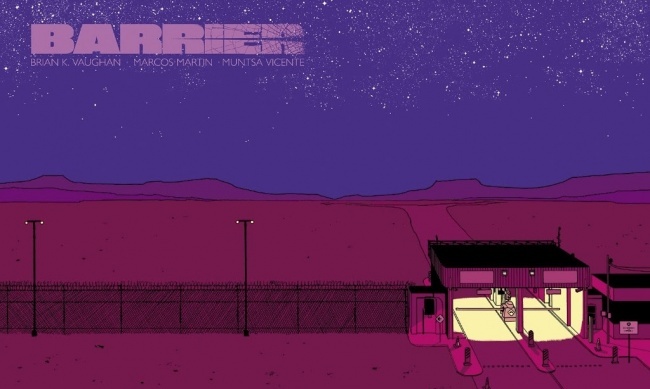 The first issue of Barrier, which clocks in at 50+ pages, will be available for free on Free Comic Book Day on May 5. On May 9, a special collector’s edition of the first issue will be on stands alongside Barrier #2. The remaining issues are slated to come out weekly throughout the month of May. Barrier will be printed in a landscape format with cardstock covers. The series is recommended for mature readers. The Image release marks the first time the work has appeared in print. Barrier was originally published on Panel Syndicate, the digital comics platform founded by Martin and Vaughan. The series focuses on Liddy, a rancher who finds a skinned horse head on her property and suspects it is a message from drug cartels, and Oscar, who is fleeing to the U.S. from Honduras. Then the aliens show up. The comic is bilingual, with both English and Spanish dialogue. The creative team already has one award-winning publication under their belts. The Private Eye won the Harvey Ward for best online comics work in 2015 (see “2015 Harvey Award Winners”) and was nominated for the limited series Eisner (see “The 2015 Eisner Award Nominees”). Click on the Gallery to view cover images.